Design is a powerful tool to change the world. Humans have been constructing their experience of the world to meet their needs by design for eons. So, why not design a future that works better for all of us, instead of just some of us? The Disruptive Design Method is an approach to exploring, understanding, and evolving complex problems into sustainable solutions. It combines systems thinking, sustainability sciences, and design methodologies to create problem-loving creative changemakers who are capable of diving deep into complex problem sets, developing strong social innovation outcomes, and reconfiguring business toward the Circular Economy. The world needs more pioneers of change, people who are willing to intentionally and thoughtfully disrupt the status quo of deep-seeded problem arenas. Innovation is useful for iterating at the edges, but what I am interested in founding is a movement of creative changemakers who have the critical, cognitive, and practical tools to understand, intervene, and activate positive impacts globally. To clarify, in the case of this approach, ‘disruption’ is used to describe the active intervention into a problem arena by diving deep under its obvious components and mining its foundations to be able to then develop a systemic understanding of what feeds the issue being addressed. Then, by applying techniques such as systems mapping, one can identify intervention points and create designs that seek to shift the status quo of the problem arena. This approach is all about intent to positively intervene and disrupt the status quo of any problem arena to ensure that the outcome is more effective, equitable, and sustainable. There is a three-part Method (that anyone can use) and a 12-part Methodology set that underpins the applied Method. Let me lay these out now. There are three distinct parts to the applied Disruptive Design Method — Mining, Landscaping, and Building (MLB) — each is enacted and cycled through in order to gain a granulated, refined outcome through iterative feedback loops. The first part is Mining, where the mindset is one of curiosity and exploration. In this phase, we do deep participatory research, suspend the need to solve, avoid trying to impose order, and embrace the chaos of any complex system. The tools of the phase are: research, observation, exploration, curiosity, wonderment, participatory action, questioning, data collection, and insights. The second part is Landscaping. This is where we take all the parts that we uncovered during the Mining phase and start to piece them together to form a landscaped view through systems mapping and exploration. Landscaping is the mindset of connection, where you see the the world as a giant jigsaw puzzle that you are putting back together and creating a different perspective that enables a bird’s eye view of the problem arena. Insights are gathered, and locations of where to intervene in the system to leverage change are identified. The tools for this phase are: systems mapping (cluster, interconnected circles, etc. ), dynamic systems exploration, synthesis, emergence, identification, insight gathering, and intervention identification. The third part of the MLB Method is Building. This is the creative ideation phase that allows for the development of divergent design ideas that build on potential intervention points to leverage change within the system. The goal is to not solve but to evolve the problem arena you are working within so that the status quo is shifted. Here we use a diversity of ideation and prototyping tools to move through a design process to get to the best-fit outcome for your intervention. The key to this entire approach is iteration and ‘cycling through’ the stages to get to a refined and ‘best-fit’ outcome. Why do we do this? Because problems are complex, knowledge builds over time, and experience gives us the tools to make change that sticks and grows. This cycling through approach draws upon the Action Research Cycle to create an iterative approach to exploring, understanding, and evolving the problem arena. The three applied parts of the MLB Method are based on a more complex Methodology set. This set combines 12 divergent theory arenas to form the foundation to complex problem identification, solving and evolving that develops a three-dimensional perspective of the way the world works. 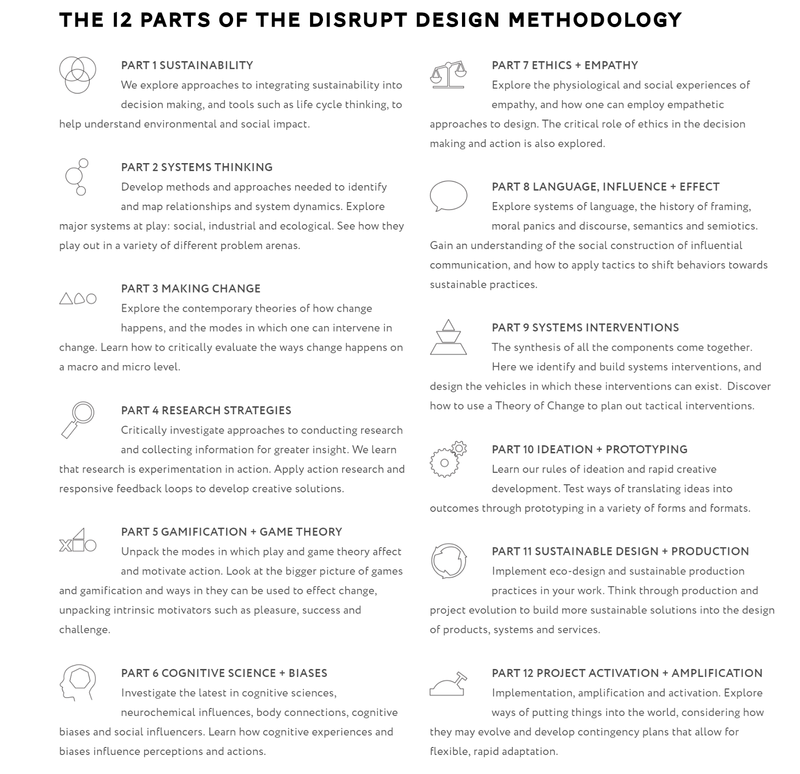 From cognitive sciences to gamification and systems interventions, the 12 units of the Disruptive Design Methodology are designed to fit together to form the foundations of a practice in creative changemaking. We teach the full set at the UnSchool as part of our online and in-person workshops. Through the MLB Method, systems boundaries are used to define the problem arenas one wants to explore and through systems mapping connection points perfect for a tactical interventions are exposed (which is often not where you would intuitively think, based on your starting knowledge in the problem arena). From this, new knowledge is built from the mining and landscaping phases, that form the foundations for rapidly developing divergent and creative ideas to intervening in the problem arena. Any problem from small, hyper-local concerns to massive global issues can be explored and evolved through this MLB Method. And, because it’s a thinking and doing practice, it can be adapted and evolved based on the problem. The core of the approach is always systems, sustainability, and design. Instead of avoiding or ignoring problems, this method teaches you how to be a problem lover who dives right into the sticky center of the issue. It also has the tools to cycle through the issues and seek out the non-obvious opportunities, designing divergent solutions that build on your unique individual sphere of influence, which is the space we can all curate to effect change on the people or things around us. Systems thinking is one of the powerful tools that we use to explore complex prob elms, it enables any practitioner to see the entire system from multiple perspectives and empowers a shift in ridged to flexible mindsets. The Disruptive Design Method is a way for creatives and non-creatives alike to develop the mental tools needed to activate positive change by mining through problems, employing a divergent array of research approaches, moving through systems exploration, and then ideating opportunities for systems interventions that amplify positive impact through a given micro or macro problem arena, which essentially is any arena in which you wish to create positive change. The entire knowledge set equips anyone with the thinking and doing tools to be a more aware and intentional agent for change. 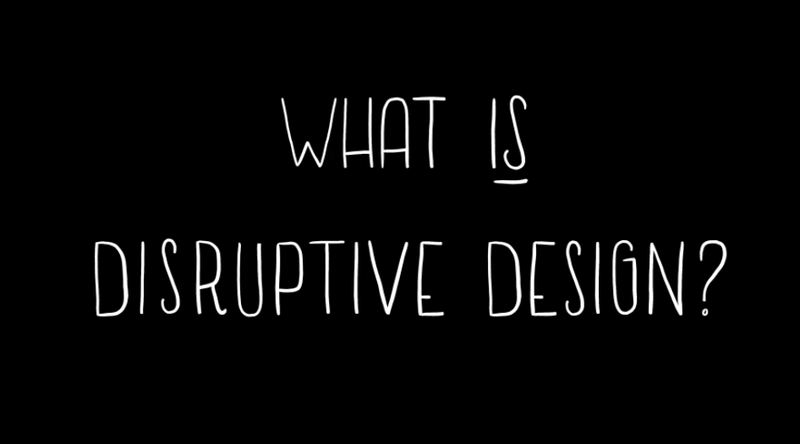 You can discover the entire Disruptive Design Methodology set in our online UnSchool, take a free introductory class here, or take a class on the Disruptive Design Method.